Upstairs Artspace wraps up summer with three new exhibits opening Saturday, August 11. An informal Walk & Talk with the artists at 5 p.m. is followed by a reception, 6 - 7:30 p.m, with refreshments, cash bar and live music. Local equine photographer Monica Stevenson enjoys a solo show, HORSEscapes, with images that include portraiture, landscapes, still life, abstract and conceptual styles. Rich in feeling and texture, Stevenson's art captures the enduring allure of our equestrian tradition. Dividing time between studios in Tryon and New York City, Stevenson is an official photographer at the World Equestrian Games in September. 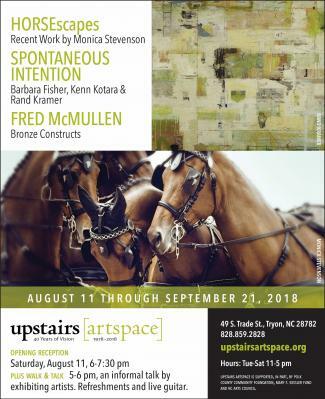 A second exhibit is Spontaneous Intention, featuring paintings by highly regarded Asheville artists Barbara Fisher, Kenn Kotara and Rand Kramer. Fisher, who is the curator, says each artist's work is about the conceptual tension between spontaneity and intention, chaos and order, risk and excess. Fisher and Kotara exhibit extensively in the South, have shown often at the Upstairs, and are in many public and private collections. Kramer recently moved to Asheville to be a full-time artist. His former career as a graphic designer now influences and inspires his abstract painting. In Bronze Constructs, Flat Rock artist Fred McMullen displays his one-of-a-kind bronze sculpture that is usually figurative -- working men, animals, birds, flowers -- with message ranging from thoughtful to whimsical. Most pieces incorporate beautiful wood as an integral part or platform. Exhibits run through September 21. Business hours: Tues - Sat, 11 am - 5 pm. 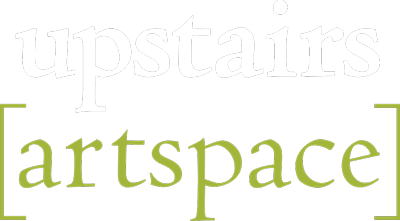 Contact: upstairsartspace.org; 828-859-2828.